Portlet Preferences are properties for storing basic portlet configuration data. Preferences are often used by administrators to provide customized views of a portlet to subsets of users or even all of a portlet’s users. Portlet preferences are sometimes made accessible to users themselves for configuring a portlet just the way they like it. Liferay simplifies making portlet preferences configurable in your portlet’s JSPs. In this section, we’ll show you how to create a default configuration JSP page and add a portlet preferences control to it. We’ll use the Location Listing Portlet we developed in the Generating Your Service Layer chapter. We’ll create a configuration page and add a custom option to it, allowing administrators to hide the address portion of the locations. Let’s dive into portlet preferences by running through an example of creating a configuration page for the Location Listing Portlet and setting up a new portlet preference for it. First, if your Location Listing Portlet doesn’t already have a setup tab in its configuration page, you’ll need to follow the steps below to create one. To check to see whether your portlet has a setup tab, click the portlet’s options icon in the upper right corner and select Configuration. If you already have a Setup tab, you can skip the next section. Otherwise we’ll show you how to create the default setup tab for your portlet’s configuration page. Notice that we’ve listed the default configuration action class. We’ll update this tag with a custom configuration class later in the exercise. 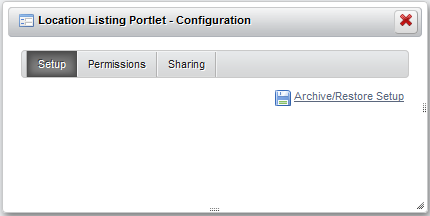 If you redeploy your portlet and open your portlet’s Configuration page, you’ll find the new Setup tab. It’s empty for now. But we’ll add a portlet preference control to it shortly. Figure 3.13: Simply by specifying Liferay’s default configuration action class in your portlet’s liferay-portlet.xml file, you provide your portlet with a Setup tab for adding your portlet’s configuration setup options. Let’s specify a configuration JSP file, first. Your portlet will need a way to display configuration options to the user. Liferay checks to see if your portlet specifies a configuration JSP via a config-template initialization parameter in your portlet.xml file. Let’s specify one for the Location Listing Portlet. In the docroot/html/locationlisting directory, create a file named configuration.jsp, if you don’t have one already. The showLocationAddress_cfg variable holds the current value of whether to show the location addresses or not. The input checkbox lets the user set the value of the showLocationAddress portlet preference key. In order for the value to be persisted, the input must follow the naming convention preferences--somePreferenceKey--. For our example, the input name preferences--showLocationAddress-- maps the input value to a portlet preference key named showLocationAddress. You’ve probably noticed some JSP compile errors and warnings with respect to the code we’ve added. We’ll address them by adding directives to the init.jsp that our configuration JSP includes. Adding the directives will allow the JSP to access the classes and taglibs we’re using. The tablib directives access the JSP Standard Tag Library (JSTL), Liferay’s theme taglib, and Liferay’s portlet taglib. Then, we added directives for importing the classes we’re using. Lastly, we inserted the <portlet:defineObjects /> tag to access implicit variables that we’ll need. It provides useful portlet variables such as renderRequest, portletConfig, and portletPreferences. Your configuration.jsp is all set to display your portlet preference options. Let’s implement a custom class to handle the configuration action. Now let’s create a custom configuration action class for accessing the portlet preference. We’ll have it extend the DefaultConfigurationAction class. Create a package named com.nosester.portlet.eventlisting.action in the portlet’s docroot/WEB-INF/src directory. In the new package, create a class named ConfigurationActionImpl, and specify DefaultConfigurationAction as its superclass. Notice we’ve extended the DefaultConfigurationAction class and added a new processAction() method. The super-class’s processAction() method is responsible for reading the portlet preferences from the configuration form and storing them in the database. Usually, you’d add appropriate validation logic for the parameters received from the form. Our bare-bones example simply demonstrates accessing the preferences from the action request. Another common method to include in a custom configuration action class is a render() method. The render method is invoked when the user clicks the configuration icon. For this example, we’ll stick with the original render method from the DefaultConfigurationAction class we’re extending. Note: You won’t need to store portlet preferences by calling preferences.store() since they’re automatically stored in the DefaultConfigurationAction class, which your configuration class extends. Since your configuration action implementation is ready to process your portlet preference, let’s update the view JSP to respond to the portlet preference. Let’s add logic in our view.jsp to show/hide the location addresses based on the value of our portlet preference key showLocationAddress. In the view.jsp file, we’ll get the value of the showLocationAddress portlet preference key. If its value is true, we’ll display all of the location fields, including the address fields; otherwise, we’ll hide the address fields. This is the <b>Location Listing Portlet</b> in View mode. results="<%= LocationLocalServiceUtil.getLocationsByGroupId(scopeGroupId, searchContainer.getStart(), searchContainer.getEnd()) %>"
If showLocationAddress_view is true, all of the location’s fields are displayed. If it is false, then the address fields are omitted. That’s it! You’ve created a custom configuration page and added a portlet preference to your portlet. Let’s see the configuration page and portlet preference in action! Navigate to your Location Listing Portlet’s Configuration page. You now have the show-location-address checkbox available. Figure 3.14: Your new portlet preference is available in the Configuration page. By unchecking the checkbox, the location addresses are hidden from view in the Location Listing Portlet. Figure 3.15: Liferay Portal makes it easy to customize a portlet UI. Privileged users can adjust the preference settings within the portlet’s configuration page. Great job! Now you know how to use Liferay’s portlet preferences in the portlets you develop. Next, let’s use the Plugins SDK to create a plugin that extends another plugin.